You are here Home » Pony Trekking in a Wheelchair – Crazy Inventor Makes it Possible. So welcome to our first podcast of 2018. This is a single interview podcast rather than our old style 2 interview episodes. I think this will be our regular format for the coming period since it enables me to get out podcasts on a more frequent basis rather than wait around to group together guest interviewees. 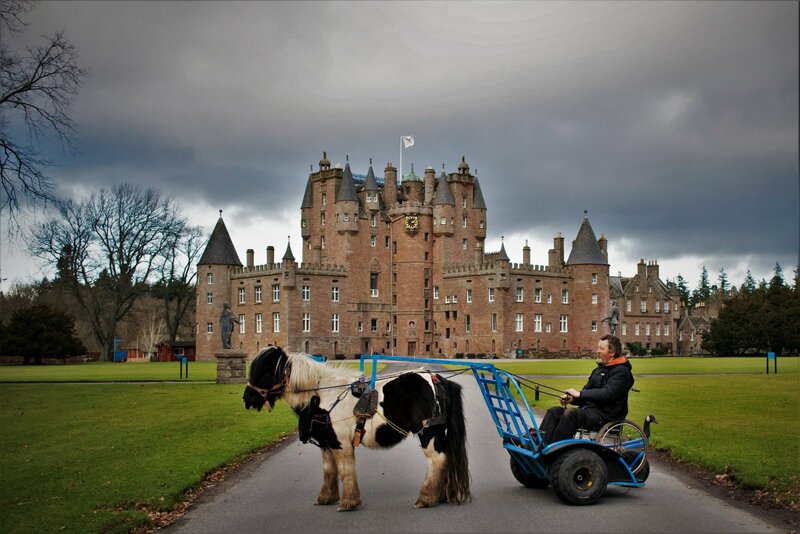 This episode we meet Simon Mulholland from PonyAxes which is an unique service for wheelchair users who wish to experience the freedom of pony trekking in Scotland. According to Simon, his amazing trekking carriage will take any weight of wheelchair and can take clients along beaches right up to the local seals. This opens up a whole new dimension of a travel experience for many of you and at a very reasonable cost. Simon charges £250 per day pony trekking in a wheelchair and normally the price is spread among several wheelchair users either coming as a group of friends or from an organisation. Simon is very quick to point out just how helpful the Scottish authorities have been in his enterprise which contrasts strongly with the many restrictions he faced South of the Border. I think this is a wonderful service and having chatted to Simon I would recommend it wholeheartedly to our disabilitymatch community. you can reach Simon on twitter @ponyaccess or on the ponyaxes.com website.